Okay guys, seeing as my Birthday is Saturday, I was trying to think of something different to do for a Birthday post. I didn't want to do the typical Birthday post because sometimes they can be a little... well, awkward. 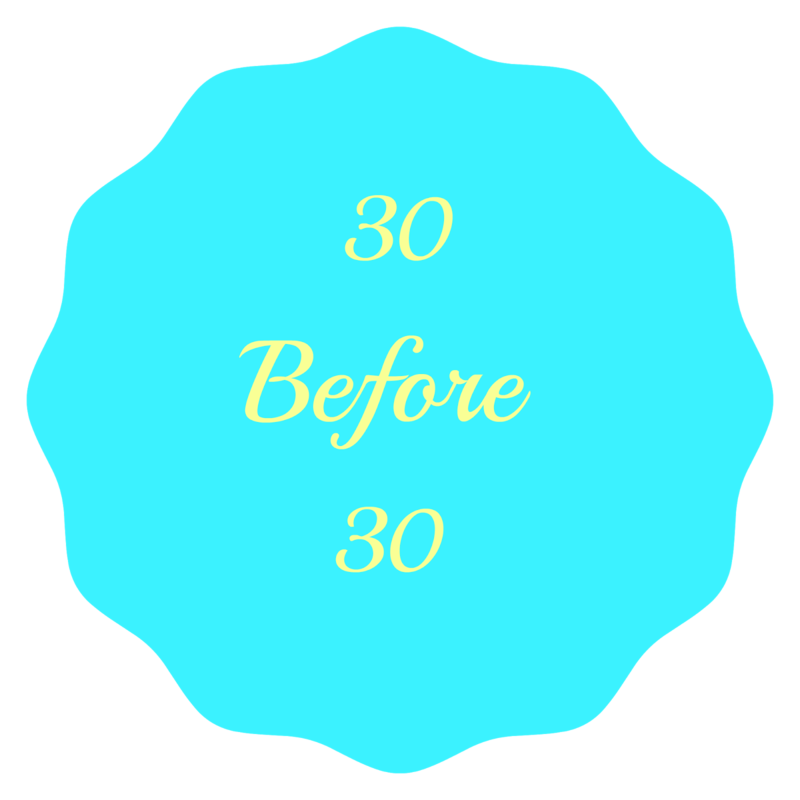 I wanted to avoid this, so I got this totally awesome idea from Kristen, a 30 before 30 list! You can view her's here. I have been really loving getting my hopes and dreams written down on paper. I hope you enjoy them as well! Linking up with Rebecca! Anyone who knows me, knows what a challenge this dream is. The reason being, I just plain out hate school. So this baby made number 1 on the list. I know, sooooo boring, but this is a big one to me as well. I don't want to live my life under the thumb of debt collectors. I have had this dream since I was a young child. I would love to spend a whole summer seeing all the different places in Europe, meeting new people, and really discovering who I am. P.S. This sounds like it would make an awesome book. I can just see it now: ridding down the streets of NY, looking out the window at all the tall buildings, while Taylor Swift's Welcome To New York is turned up on the radio. Can you tell I like movies? 5. See a Broadway play, on Broadway. I love musicals and plays, so this is a big thing for me. I would be on cloud 9! Ever since Free Willy came out when I was two, I have been obsessed with orcas. I actually wanted to be a trainer for Seaworld. Not gonna lie, it would still be pretty awesome. Another life long dream. You can thank Flipper for this one! Not necessarily own my own house, more along the lines of be living somewhere other than my parents house. It's well past time. In case you didn't know, I'm a huge dog lover over here! This one would seriously make my life complete. I know this sounds extremely cheesy, but I desire to meet that special someone, fall in love, and start having a life with them. Keeping my fingers crossed. I have been a swiftie from the very beginning! I've wanted to go to her concerts multiple times but it never worked out. It will happen and soon! So, I started this one last week. I found out real quick it's going to be a hard task. One of the funnest work outs I have ever taken in my life! You should see if class are offered where you live. I love being able to make precious moments last forever. Photography is one of my favorite hobbies and I really want to become better at it. Reading is my vice, so this one should be pretty easy. I have like five friends who know how to play and I have no idea why I haven't learned yet. Two of my really good friends have completed this run, and it looks like so much fun! Shoot, I'm a poet and I didn't even know it! Taking care of your body is a really important factor in living a happy and full life. It's time I really started working on my life style choices. Not to become famous or anything. Mostly to have something to pass down through my family. A recording is a little piece of you that will live forever. I think that's incredibly cool. I just want to grab my best friends, hop in an old VW van and drive across this beautiful nation. It's a grand adventure I cannot wait to embark upon! It's something I've wanted to learn how to do for years. Somebody's got to sign up and teach this girl! Any takers?? This goes in hand with finishing college. I can't be a third grade teacher until I get that degree! Sailing has always seemed so magical to me. I love the ocean and I think sailing across it would be a pretty awesome experience. I've sang in front of my church family, but never in front of a random crowd. I would be the girl up there taking it way to seriously. Ha! Preferably one with Chris Hemsworth. I have been in a relationship with Jesus since I can remember and I still haven't read the Bible cover to cover. It's long over due. Everyone should know by now that I am a HUGE Disney lover. I have wanted to go since I was literally three years old! I will make it there, eventually. This is something I struggle with... I am constantly doubting my worth and feeling like I'm never good enough. By the time I'm 30 I want to be happy with who I am. Well, That's it for my list! I was thinking that 24 would be the perfect age to write this down and start checking things off. What are somethings you hope to accomplish? I love Jazzercise & always said I wanted to be an instructor... I did Jazzercise for 10 years - only stopped when they moved & its not close to me now. LOVED IT! GREAT list! I am currently working on my list and you have some wonderful ideas...the perfect mix of fun and productive! I look forward to reading your list!